Friday the 17th was the first session of my Collection Maintenance class, taught by Donia Conn and held at the North Bennet Street School. It was a lot of fun. The format of the class is half lecture/half hands-on learning. This week’s focus, after the introduction, was paper, and after spending the morning learning about how our paper-based collections degrade and what we can do to preserve them, we got to the really fun stuff, including a demonstration on humidification and flattening and some hands-on experience with paper repairs. We were required to purchase tools for the class. I probably could have gotten away with using my own (at least one other student is), but my collection is still pretty small, and there are no exact duplicates. 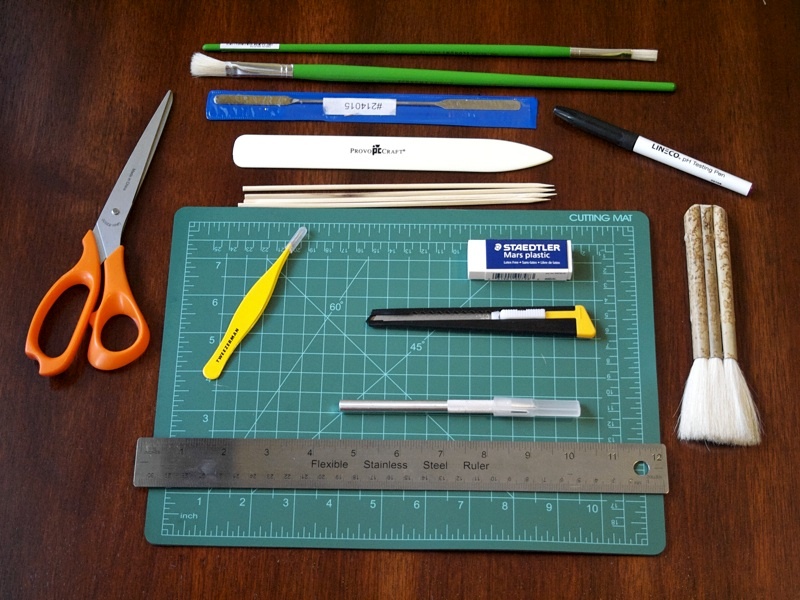 Besides, tools for bookbinding could have slightly different needs than tools for preservation (for instance, I don’t think I could get away with a 12 inch straightedge for cutting bookbinding materials), and having a portable cutting mat, in particular, might prove useful in the future. The standard tool kit for the course. 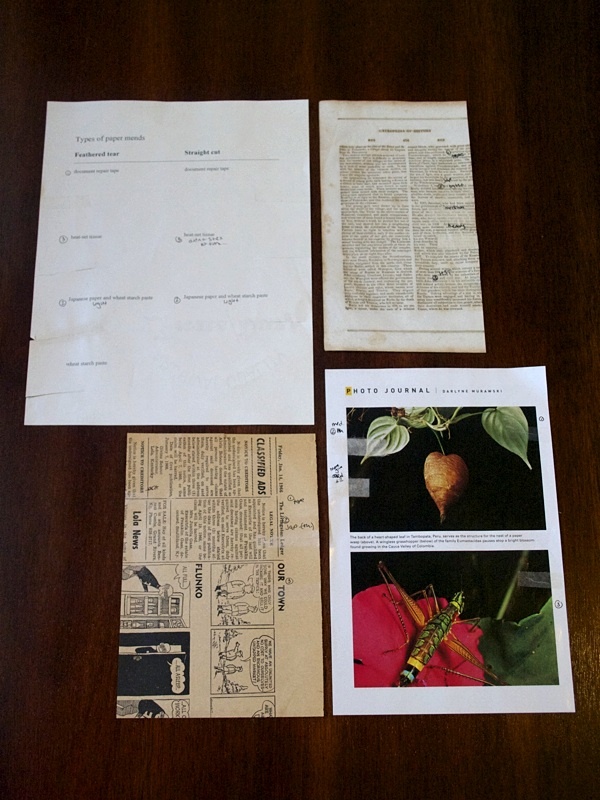 We were given four papers on which to practice repairs: modern printer paper, clay-coated paper, old newspaper (from the 1960s), and old book paper. On the modern printer paper, we practiced mending both tears (which have feathered edges) and cuts (which have sharp edges). On the other papers, we worked with each of the repair types as we saw fit. We were given three weights of Japanese tissue, some heat-set tissue (which requires a tacking iron to use), and Filmoplast tape, and we learned how to cook starch paste in a microwave (for use with the tissue). We also cut small pieces of Mylar to aid us in safely removing harmful fasteners such as paperclips and staples from the old newspaper, which was more difficult than you might expect. Various tissues and other materials used for paper repair. My favorite process involved the Japanese tissue, so I’ll describe that one here. First, the tear must be properly aligned. 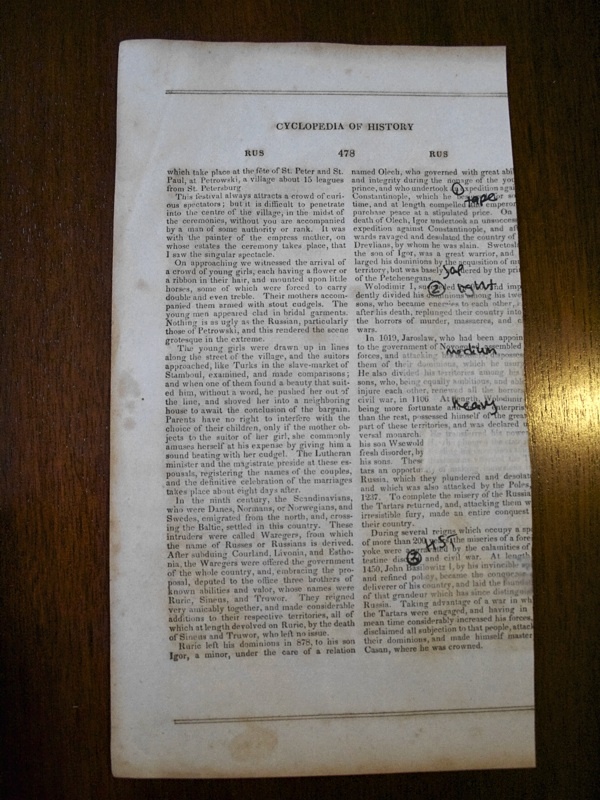 This is especially important for layered/feathered tears (i.e., not cuts), where one part of the paper will want to rest on top of the other; reversing this natural order will result in a sloppy repair, not to mention lost information. The tissue is then moistened with paste over blank newsprint, removed from the newsprint with tweezers, and placed over the tear. Hollytex or Reemay (which allow air to pass through but won’t stick to the paste) is placed on top of the repair, and a bonefolder is used to carefully smooth down the tissue. It’s important not to use too much pressure here, since the tissue can shift during this process. For drying, blotter is placed down first, with a piece of Hollytex or Reemay on top. The repaired, but still wet, portion of the paper is placed over this bed, followed by another piece of Hollytex or Reemay and more blotter, creating a sort of sandwich. Plexiglass or board goes next, to keep the surface smooth and even, and a weight (we used cloth-covered bricks) tops it off. The paper sits like this until it is fully dried; otherwise, the paper will warp around the repair. We experimented as much as we could in the time allowed, sometimes using paste that was too thick to see why it had to be thinned, and sometimes not using weights for drying. We also learned about what types of repairs work best on what types of paper, and were encouraged to think about why that might be the case. I won’t go into any of that now, however, since we have an assignment on that very topic due this week. The end result of my attempts at paper repair. Below you can see one of my experiments from class in more detail. I did each type of repair on this old book paper, but this was the only paper on which I tried all three weights of Japanese tissue. As is clear from the picture (click on it for a larger view), the heavy weight is useless for repairing paper in this manner, and the medium was also not as invisible as you might hope. The thin tissue, however, is nearly completely invisible (and the repair would almost certainly look better if I had more practice). Indeed, it’s nearly invisible to the touch, as well (although again, it would feel even better if I could have afforded more time for drying—I only had enough materials to allow one repair to dry at a time, and there was a lot to try). Alternatively, perhaps my paste should have been a bit thinner than it was. Attempts at each of the three types of repair on old book paper. 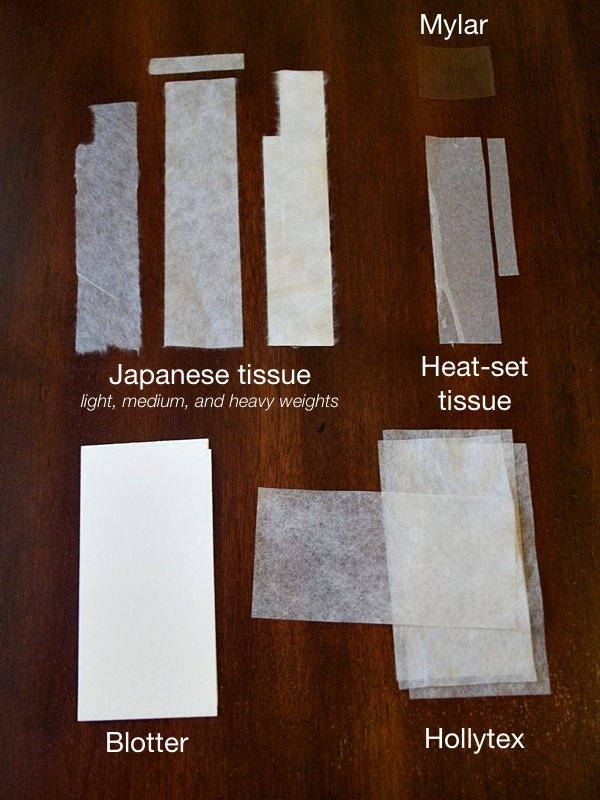 Here I also tried all three weights of Japanese tissue. I took home the paste, which can last a few days, so I was able to to practice more repairs with what tissue I had left. The best results came with ample time—it really is a matter of patience. 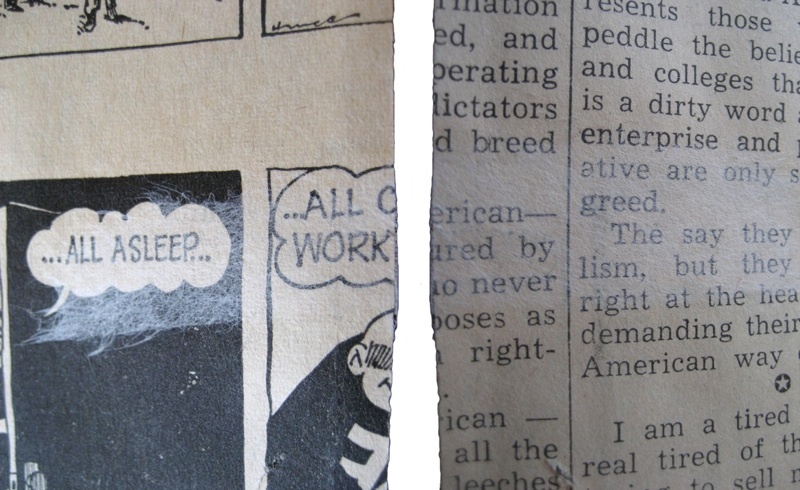 For this one, I used the thinnest Japanese tissue we had to repair a tear in the 1960s newspaper on not one, but both, sides. This was extremely successful, although you can still see the tissue over the solid black portion of the comic. It would help if the tissue were an off-white. Probably my best repair yet. Donia also suggested that we try our hand at removing some of these repairs, which I was excited to attempt—one of the main aims of preservation repairs is reversibility, and it was great to see the (in)effectiveness of this first-hand. In class, we practiced removing a pressure-sensitive tape repair from the old newspaper, which I had reasonable success with (microspatulas really are wonderful tools). However, as a rule, tape is terrible in this regard, and I think I mostly got lucky that it hadn’t been pressed down too hard and wasn’t on the paper very long. At home, I tried removing one of the Japanese tissue repairs (most of the heat-set tissue repairs actually removed themselves) from the clay-coated paper, and it was quite simple, although it still requires care and attention. In short, this class looks to be both fun and great experience. Next time, we’ll be learning about basic book repair, so check back for an overview soon!